Dinosaur food isn’t free, as the father of a 7 year-old boy in the UK learned. Somehow, Mohamed Shugaa’s son learned not only the password to Dad’s iPad but the super-secret password to his Apple ID account. That allowed the youngster to rack up $5,900 worth of charges in the game, “Jurassic World.” Dad, of course, blames Apple, not himself. "A monkey, an animal-rights organization and a primatologist walk into federal court..." That was part of a quote from the attorneys representing David Slater, the British photographer in the “monkey selfie” case. A U.S. District Judge ruled that monkeys can't claim copyright. Not so smart... The developer of Lumosity “brain-training” software will pay $2 million to settle deceptive advertising allegations levied by the FTC. Lumosity must also inform all of its subscribers that the software will not improve their performance at work and school, or stave off dementia, and offer them the opportunity to unsubscribe. "TP phone home?" British astronaut Tim Peake intended to call home from the International Space Station, but dialed the wrong number by mistake. He later sent an apology via Twitter. Finally, a killer app for Apple Watch. Taiwan researchers developed an app that lets them remotely control a flying drone using arm gestures, and a spherical droid similar to BB-8 from Star Wars: The Force Awakens. Maybe this will awaken Apple Watch sales. 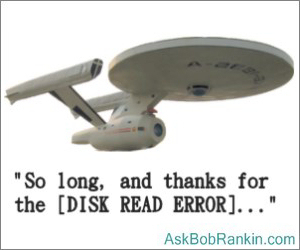 The last words of Star Trek creator Gene Roddenberry have been liberated from over two hundred 5.25-inch floppy disks, each of which held only 165 kilobytes of data. Data recovery experts at DriveSavers needed three months just to figure out the CP/M file system layout. It seems robots are doing everything else, so why not a robotic bartender? The Bernooli Cocktail Discovery is a Bluetooth-enabled, app-controlled system that pours precise amounts of liquors to mix cocktails selected from a library of global favorites. Canada experiences far less cybercrime than the U. S., for reasons unclear to security researchers. Could it be Canada is just a more polite society? Eastman Kodak is bringing back the Super 8 film format, complete with 8mm film. Kodak stopped producing Super 8 in 1982, but apparently thinks the retro/nostalgia trend will support a “modern” Super 8 camera that costs $400 to $750, and film cartridges that cost $50 to $75 to have processed. Popular Science magazine explains how to build your own cotton candy machine for only $26. Amazon explains how to buy one for three bucks less. From (or “for”) the bowels of the 2016 Consumer Electronics Show, we bring you the new generation of the Neorest toilet that needs manual cleaning only once a year. Despite its $9,800 price tag, over 40 million earlier versions have been sold worldwide. The latest 3D printer uses paper instead of plastic filaments or resin. Mcor Technologies’ ARKe desktop printer uses Selective Deposition Lamination technology to create full-color 3D printed objects with a DPI of 4800 x 2400. The list price is $5,995; steep, but considerably less than industrial full-color 3D printers. Most recent comments on "Geekly Update - 13 January 2016"
The last words of Star Trek creator Gene Roddenberry if on CP/M media could have been read by a functional Kaypro computer. Wish I still had mine from the 1970's along with WordStar and its dot commands. Bob, being a Canadian, I must agree with you analysis of lower cyber crime here in the True North. Love your articles and helpful hints. The NY Times had an article about the Toto (aka Neorest) toilet in its Nov. 18, 2015 issue titled "The Cult of the Toto Toilet". Apparently those who use the toilet don't like to go anywhere else. The article has a paragraph about an owner who waited over 9 hours until he could make it to his Toto. The name for this bathroom furnishing is "washlet". I was surprised as to how many links from your page my computer jumped before taking me to a BBC article. The Times article was ignored. Really enjoyed the Roddenberry story. I learned programming on a Radio Shack TRS-80 that was modified to use double-sided 80 track 5.25 floppy disk with NO hard drive. The company I worked for used Kaypro's (CPM) for their training. A couple of years ago (when he was 4), my grandson racked up $860 in charges at the Play Store for Angry Birds coins. I'd purchased $5 or $10 worth, and then I handed him the phone without realizing that my password setting allowed subsequent purchases without a password for the next 30 minutes. Thankfully, I was using my computer while he had my phone. With less gratitude, I must report that all the emails came in at exactly the same time, giving him 15 minutes in which to dent my net worth. After that, I fixed some settings, and I counted my lucky stars that it wasn't worse. I was lucky that Google sends immediate notifications (Apple doesn't) and that there was a time limit on the password. I do think the people who are critical of the father in the article must be childfree. You simply cannot watch kids every second. Keeping them safe from harm is the top priority; stopping their depletion of your bank account is lower on the list. What's the big deal with CP/M? It was the lead candidate as the operating system when IBM first offered the PC and was specifically designed to be compatible with the instruction sets of most common processors of the time. Somewhere there are still 5-1/4" discs available (NOS), lots of reformatable used ones, even instruction books and OS discs. Seems like DriveSavers needs more savvy managers and fewer geeks.